The American workplace is changing rapidly, as technology and automation transform the nature of work. Even with the economy at or near full employment, the public is skeptical that the future will bring more job security, and they are wary about the long-term impact of technological innovation on workers. Only 14% of adults say, by the year 2050, the average working person in the U.S. will have more job security. About half (49%) say workers will have less job security, and 36% say jobs will be about as secure as they are now. Men are somewhat more pessimistic than women about future job security, and those who attended or graduated from college have a more negative outlook than those who did not continue their education beyond high school. In addition, Democrats are more likely than Republicans to predict that workers will have less job security in the future. While pluralities across racial and ethnic groups anticipate less job security in the future, blacks and Hispanics are about twice as likely as whites to say workers will have more job security (24% of blacks and Hispanics say this compared with 9% of whites). When asked more specifically about employee benefits in the future, public views again skew negative. Roughly one-in-five adults (22%) say, by 2050, the average working person in the U.S. will have better employee benefits than they do now. About twice that share (41%) say benefits will be worse than they are now, and 36% say they will be about the same. Views on benefits follow similar patterns to those on job security. Men are more pessimistic than women and Democrats more downbeat than Republicans. And, again, blacks and Hispanics are more likely than whites to say things will be better in the future. Relatively few adults see an upside for workers from automation and new workplace technologies. Roughly half (48%) say these advances have mostly hurt American workers, while only 22% say they have generally helped. About three-in-ten (28%) say automation through new technology has neither helped nor hurt. There is a notable age gap in opinions on these changes in the workplace. Adults 50 and older are more likely than their younger counterparts to say that automation has mostly hurt workers (55% vs. 43%, respectively). In addition, those with a high school degree or less education are more likely than those who attended college to see negative repercussions from new workplace technologies, while blacks and Hispanics are more likely than whites to say these changes have helped workers. Looking forward, most Americans think automation will reshape the workplace – but not necessarily for the better. A large majority say, 30 years from now, robots and computers will do much of the work currently done by humans, with 30% saying this will definitely happen and 52% saying it will probably happen. Among those who say robots and computers will do much of the work currently done by humans in the future, most think this will be a bad thing for the country – 40% say this will be somewhat bad thing and 29% say it will be a very bad thing. In spite of these negative predictions, most workers do not believe that the type of work they currently do will be done by robots or computers in the future: 24% say this will definitely not happen, and 38% say it probably won’t. Still, a quarter of workers say this probably will happen, and 11% say it definitely will. Workers with no college experience are among those most likely to say the kind of work they do will be done by robots or computers in the next 30 years: 47% of those with a high school diploma or less education say this will happen compared with 38% of those with some college experience and 27% of those with a bachelor’s or higher degree. Lower-income workers also are more likely to say their current work will be done by robots or computers: 52% of those with an annual family income of less than $30,000 say this will happen in the future, compared with 37% of those with family incomes between $30,000 and $74,999 and 26% among those with incomes of $75,000 or higher. Americans have a negative view of the broader impact that automation will have on society. 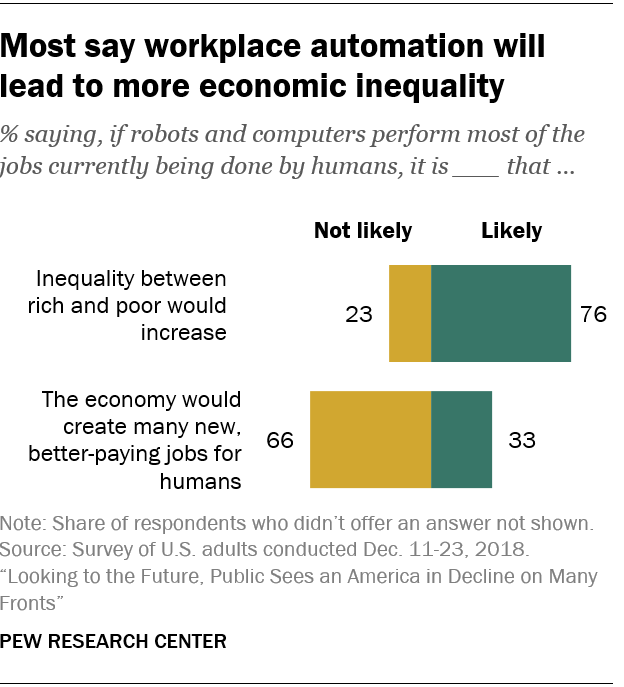 Roughly three-quarters of adults (76%) say inequality between the rich and the poor will increase if robots and computers perform most of the jobs currently being done by humans. This sentiment is widely held across most demographic groups. Democrats (82%) are somewhat more likely than Republicans to say that inequality will increase. But, even among Republicans, 72% say this change is likely. The public is also skeptical that more good jobs will be created if robots and computers play a bigger role in the workplace. About two-thirds of adults (66%) doubt that the economy will generate many new, better paying jobs if robots and computers mostly replace human labor, twice the share that say better jobs will follow widespread implementation of these technologies. Higher-income adults and those with a bachelor’s degree or more education are somewhat more optimistic that new technology will create better jobs. But, even among these groups, majorities say greater automation in the workplace isn’t likely to lead to an improved job picture in 30 years. Previous research has shown that the vast majority of American workers believe it will be important – if not essential – for them to get training and develop new skills throughout their work life in order to keep up with changes in the workplace. Most adults say the primary responsibility for providing workers with the necessary skills and training resides with the education system and individuals themselves rather than with government or employers. When asked who should be most responsible, over the next 30 years, for making sure American workers have the right skills and training to get a good job, about four-in-ten adults (39%) point to the education system. An additional 34% say the education system should be second-most responsible. Similar shares say individuals themselves bear the primary (39%) or secondary (30%) responsibility for ensuring that workers have the necessary training to get a good job. By comparison, the public is much less likely to say employers or government should play this role. Only 11% of adults say employers should be most responsible for ensuring workers have the right skills and training, and the same share say government should be most responsible. Some 25% and 11%, respectively, say employers and government should have secondary responsibility in this area. The public sees education playing an even bigger role when it comes to ensuring young adults have the skills and training they need to get a good job. Roughly half (53%) say the education system should be most responsible for providing young people with the necessary tools to succeed in the labor force, while 32% say it should be up to young adults themselves. Overall, more than eight-in-ten adults look to the education system to play a primary or secondary role in preparing young people for the workforce. About seven-in-ten say the onus should be on individuals themselves. Again, a relatively small share of the public says employers (5%) or government (10%) should bear the most responsibility for providing young adults with the skills and training they need. About one-in-five say either government or employers should be mainly or secondarily responsible for training younger workers. Blacks and Hispanics are more likely than whites to say government should be most responsible for making sure that workers have the right skills and training: About one-in-five blacks (20%) and Hispanics (19%) look to government to play this role, compared with 7% of whites. And young adults are significantly more likely than their older counterparts to say the education system should be primarily responsible for this (50% of those ages 18 to 29 say this, compared with four-in-ten or fewer among older age groups). There are significant gaps by party on this measure. A majority of Republicans (59%) say individuals should have the most responsibility to ensure they are prepared for the workplace; only 23% of Democrats say the same. For their part, Democrats are twice as likely as Republicans to say the education system should be most responsible. Democrats are also more likely to say government should play this role, but, even among Democrats, only 15% say government should be most responsible for this (5% of Republicans say the same). The patterns are similar when it comes to who should be responsible for preparing young adults for the workplace.